All you really need for riding, racing, training - if you don't need a map! Strava compatible too! It's the little things that make all the difference, which is why you're going to love Edge 130. 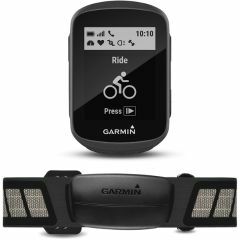 This ruggedly compact but capable GPS cycling computer has everything you need to navigate your ride, monitor stats, stay connected with loved ones and much more. Compact and lightweight, easy to mount on shorter stems and can even come with a mountain bike (MTB) mount to lift the device above the stem while keeping it out of harm's way. The 1.8 inch mono Memory in Pixel (MIP) display means you'll get a completely crisp view of the screen, even in direct sunlight when you'd normally be squinting at your smartphone screen. Its five-button interface is easy to navigate, and you can even customise the display to show up to 8 data fields on each screen.